For years I knew that cycling from the Westside to the Valley was faster than being in a car, but now I finally had the opportunity to prove it. Working out of Westwood for a significant portion of my life, I hated sitting in turtle paced traffic when I had to drive. For the most part, I would either bike or even run over the hill because I saw time sitting behind the wheel as wasted and if my travel could also serve as my workout time, my day would be far more efficient. Surprisingly, running would be faster than driving during rush hour starting from the time I left work because you have to factor in the long walk to the parking lot and the jam just to get out of it. It could take 15 minutes before I even got onto the road! Another thing I learned back then was all the secret cut throughs to drive on because back then I like to explore a bit. Now thanks to Waze, these passages are available to all and traffic getting over is exponentially worse. Still, are you going to take my word for it? Google Map suggestions for a Thursday commute. 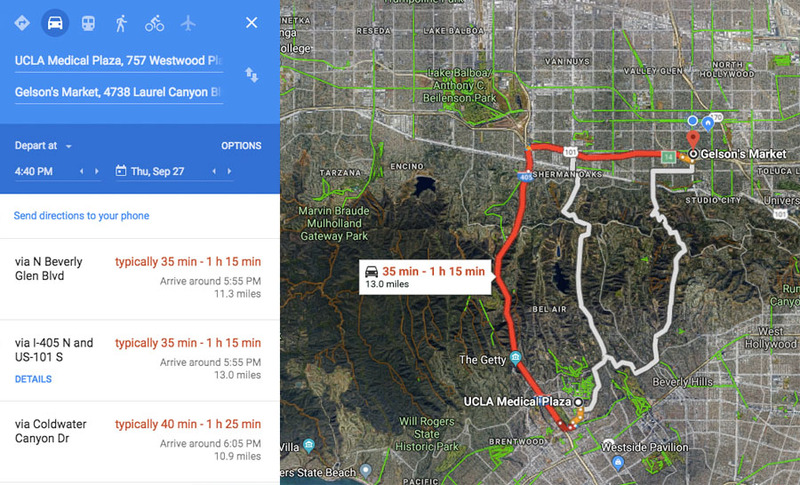 Last week, we had a family appointment at the UCLA Medical Center and since Mrs. CV drove over (not to mention my parents coming separately with CV Jr.), I thought it was the perfect opportunity to see who could get to our neck of the woods first. My better half had the advantage of Google Maps giving out real-time updates. I also decided not to factor the amount of time it would have taken her to get out of the parking garage, let alone get to her car which would have tacked on at least another five minutes. I was backed by nothing but my gut instincts that have been forged by the smog for decades! Pretty confident that traffic hasn’t improved over the years, here’s our results. This was a real simple win and if we had started a half our later at the normal hour of rush hour traffic, I’m sure my 2 1/2 minute gap would have widened. I admit this ride may not be for everybody, as it takes a little bit of climbing, but if you caught the guy at the 2:33.05 mark riding an e-bike, I’d go for that option too. Traffic also isn’t the biggest concern for me either as there’s a lot of turns and stops keeping drivers more honest than other routes. 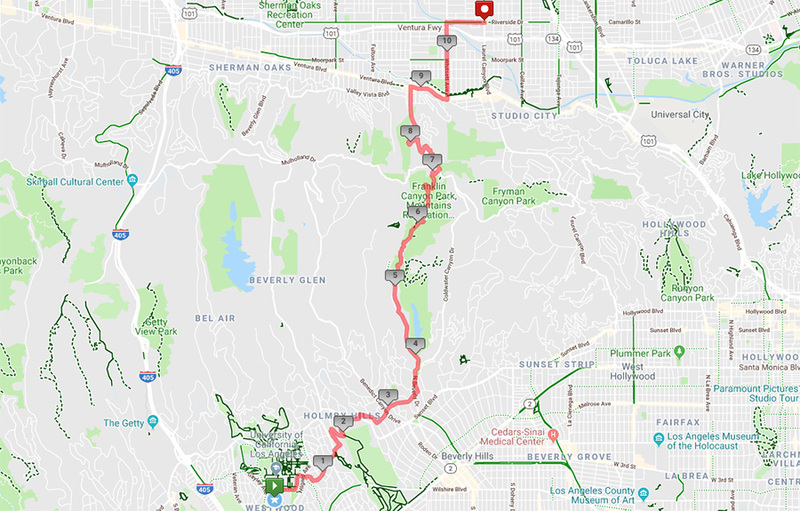 The descent on Coldwater Canyon is also slightly technical, but if that’s too much you can always do the dirt at Fryman Canyon (ride slow around the hikers). Needless to say, I find biking just as efficient as driving in LA, especially during rush hour factoring the time spent looking for parking, and walking to and from that spot. Plus, it also replaces the time needed for a gym workout! …and driving to that as well. Epilogue: You may notice as I was entering Franklin Canyon Park that I stopped for about a minute. Right before that portion, a car came up right behind me and planted his horn to pass. There wasn’t really space to safely get by me at that point and I was waiting for the roadway to widen up a couple houses ahead before I got over. I let him know that was a rude thing to do and of course, he pulled over for a lively discussion. He thought I was in the wrong, but he asked to provide proof what I was doing was legal. I was a bit winded to pull CVC.21202 out of my mouth, but I essentially said that I was riding correctly that I didn’t have to pull over unless there was a group of five or more cars behind in a safe enough space. Sure, there’s more to it than that, but did I really want to pull out my cell phone to prove it at the time? Of course, I easily passed him later on as he waited to reach Mulholland and I thanked him for being somewhat reasonable, although he was still mad at that point too.